Playa del Carmen, which is on the way to Akumal and Puerto Aventuras from the airport, offers a great selection of imported and national products at reasonable prices. Sam's, Wal-Mart and many of Mexico's major grocery retailers have locations in Playa del Carmen. 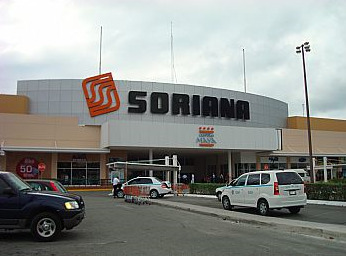 One of our suggested places to shop and also one of the most accessible is Soriana. This is a large retailer with a strong selection of fresh produce, imported meats and cheeses, beer, wine, spirits and staples. They also have a large pharmacy department, clothing, and many other items you might commonly find at a major grocery store in the US or Canada. Soriana is located on south end of PDC and the west side (right side when traveling south on highway 307) of the highway opposite Sam's Club. 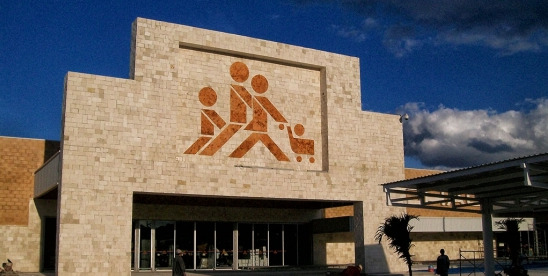 It is located within a very large mall area called CENTRO MAYA. The mall is easy to spot, with access via the frontage road that runs parallel to the highway. Be sure to exit at Avenida Juarez on the flyover and continue until you see the CENTRO MAYA sign. When traveling north from Puerto or Akumal, stay in the center lanes when the highway divides to make a left into CENTRO MAYA. Open Daily 8:00 AM - 10:00 PM. Credit Cards Accepted. Chedraui has 3 locations. 1) Just off of highway 307 towards the southern end of Playa Del Carmen on the east side of the highway just at the southern end of the flyover. 2) Super Chedraui at Puerto Aventuras, easy exit and highway return, selection of produce can be hit or miss. 3) Tulum, beach road, 1/2 km east of 307, very nice store. Open Daily 8:00 AM - 11:00 PM. Credit Cards accepted. Walmart and Mega Comerical are located close to Avenida Consituyentes and Calle 30 in downtown Playa Del Carmen and are a bit more time consuming to get to and from. All of these options offer substantial selections and a variety of products making it easier than ever to eat well and inexpensively during your visit. Fresh produce, imported and local meats/seafood, beer, wine, and other spirits, beach toys, snorkel equipment, clothing and pharmaceutical items are all available. Wal-Mart is located in Playa del Carmen on 30th Ave, between 8th and 10th Streets. Open Daily 7:00 AM - 11:00 PM. Credit Cards Accepted. There is also a newer location of Wal-Mart on the Arco Vial (115th Avenue), a few blocks north of Plaza Las Americas. Mega Comerical Mexicana is a very large super store complete with food items, produce, electronics and pharmacy. Located in Playa del Carmen on 30th Ave, between 16th St. and Constituyentes. Open Daily 7:00 AM - 12:00 AM. Credit Cards Accepted. DAC offers excellent Fresh Produce, specialty Cheese and Dairy Items, local artisan breads and sausages. Many items are not on display. Fresh greens, mushrooms and many other may be stored in large coolers. Just ask for assistance. Try the Juice Bar and small restaurant located in front, really great eats. Located in Playa del Carmen, 30th Ave, between Avenida Constituyentes and 20th St. Open 7:00 AM - 10:00 PM Daily and 7:00 AM - 2:00 PM on Sundays. Credit Cards accepted. At Pescadaria Oceano fresh seafood is available every day. Oceana will also fry whole fish on site to eat there or take away. As with all fresh seafood, the quality can vary so we encourage you to shop carefully. Located in Playa del Carmen, 34th St, between 35th and 40th. Open 7:00 AM - 4:00 PM, Monday - Saturday. Cash only. Sam's Club is especially great for USDA meats, wines and spirits also available. Located just off Highway 307, prior to the PlayaCar entrance. Open Daily 7:00 AM - 9:00 PM. Credit Cards Accepted. The Super Chedraui is located on the west side of the highway 307 accessed from the south bound lane at the Puerto Maya turn off. The store is well stocked with a good range of groceries and beverages, meats, cheeses, frozen items, pharmacy, kids and baby supplies, beach products, and much more. As we mentioned before, produce can be iffy. If you can, we suggest hitting the Famers market in Puerto or Akumal, Wednesdays and Saturdays, 8 - 4 PM. Open Daily 8 AM - 10 PM, Credit Cards Accepted. In the Chedraui shopping mall there is also a good Chinese takeout restaurant and a good sausage/pizza restaurant. 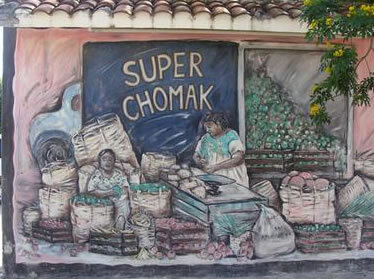 Super Chomak (Locally known as the "Pay More Chomack") is located just at the entry to Akumal before the arch. A large selection of imported products, liquor, beer and wine. They also carry swim suits, sandals, clothes, sunglasses, sunscreen and other things you might find you need and don't have. Open 7:00 AM to 9:00 PM Daily. No liquor sales after 3:00 PM on Sundays. Credit Cards Accepted. El Pueblito is located across from Super Chomak, just next to the Mulgrew Lavanderia. Good selection, better priced in many cases. Open 7:00 AM to 9:00 PM Daily. No liquor sales after 3:00 PM on Sundays. Credit Cards Accepted. 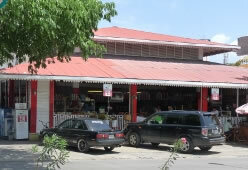 San Francisco de Asis is a mid-sized grocery store offering fresh produce and national products. Located in Tulum at the intersection of Highway 307 & Coba Road. We at Sol Maya are not a big fan of this option. Open Daily, 7:00 AM - 10:00 PM. Credit Cards Accepted. Super Chedraui is a new and well-stocked grocery store located on the north side of the beach road which leads from the Highway 307 to Tulum beach. This is the largest store in Tulum and includes a bakery and a really nice Deli selection. Open Daily, 7:00 AM - 10:00 PM. Credit Cards Accepted. Bodega Aurera is part of the Sam's Club chain although a membership is not required. Located on the left hand side of the road leading from Tulum to Coba. Good selection. Warehouse style store. Open Daily, 7:00 AM - 10:00 PM. Credit Cards Accepted. OXXO is a convenience store, but with a great selection of wine, spirits and imported products. Located in Tulum on the Coba Road, just west of the intersection with Highway 307 (across from the San Francisco de Assis grocery store). Open Daily 6:00 AM - 9:00 PM.